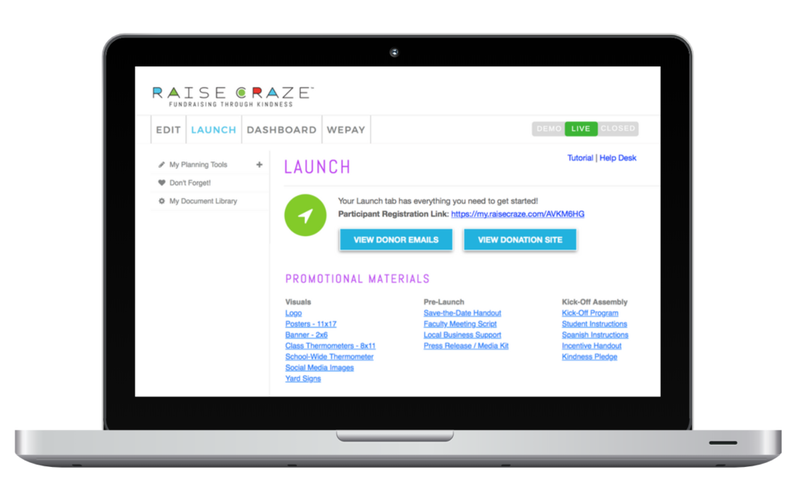 Raise Craze is easy to customize for organizations of all sizes. You don't need a huge committee or an army of volunteers. We provide you with all of tools you need to be successful. Follow our 3 simple to-dos to get started. All the convenience of an outsourced fundraiser without the hefty expense! Within your account, you will be able to download our list of suggested acts of kindness. However, let's figure out what makes your school tick. Is there an organization close to your school's heart or a local need that's known school-wide? Take our list and run with it or add a few that will resonate with your participants! At Raise Craze, we are all about making it easy! We provide you with a complete promotional package, including a Kick-Off Program, Social Media Campaign, Parent and Teacher Communications, Student, Instructions, Morning Announcements, and more! Copy and paste or edit to your heart's content! What gets your students motivated? While incentives aren't required, we understand that they can be real motivators! Download our Incentive Ideas to spark a plan on how you can reward your students. We recommend rewarding for completed Acts of Kindness because everyone can spread kindness! Throw Out The Old Notebook. It's All Here! Document Library which will provide you with everything you need before, during, and after your fundraiser. personalized websites & Emails - in just 3 clicks! Participants register, pick their acts of kindness, and enter email addresses. We'll take it from there - donors will be thrilled to see what lands in their inbox!